This week's Friday Find is coming from Tiffany Stevens an experienced Northwest wine aficionado. Each Friday we highlight a wine from the Northwest that we think is a real "find." By find we might mean that it's a steal, as all of these wines we'll feature weekly are under $20. We might also mean "Hey, you really need to go find this" and it might be a wine that we feel not enough people know about. In any case, with the weekend pending we're hoping to help you "find" a wine to kickoff the weekend right. We'll tell you a little bit about the wine and try to help you track it down here in the Northwest. With this week's Friday Find, we continue our exploration of the many amazing Northwest red blends. You will often hear the Owen Roe's Abbot's Table described as a crowd pleasing wine, a great go-to wine for entertaining. 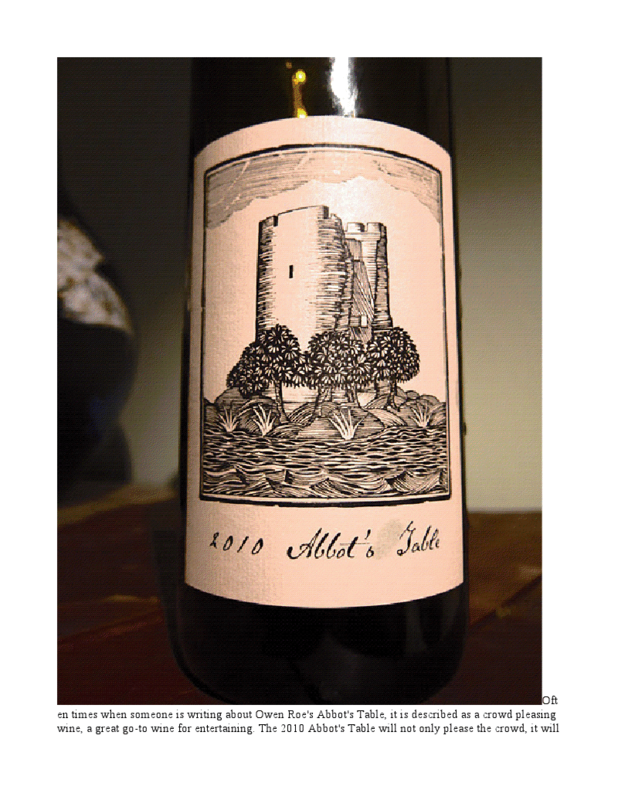 The 2010 Abbot's Table will not only please the crowd, it will impress. Why? For around $20, this wine delivers in a big way, perhaps the best Abbot's Table yet. Although released only a few weeks ago, this wine is surprisingly cohesive. It has vibrant aromas and flavors of juicy dark fruit, cherry and hints of chocolate, balanced with good structure and smooth tannins. This is an expressive wine, drinking very well now, but has the structure for some bottle age as well. David O'Reilly's blend varies from year to year. It is a seemingly eclectic mix of varietals from Yakima Valley fruit. The 2010 is atypical in that Sangiovese comprises 48% of the blend, more than twice the amount in each of the previous 3 vintages. Sangiovese is not typically at the forefront of O'Reilly's wines, but clearly it works beautifully here. The remaining blend is 15% Blaufrankisch (also known as Lemberger), 14% Zinfandel, 14% Malbec, 7% Syrah and 2% Merlot. The 2009 blend included 20% Cabernet Sauvignon and 13% Grenache, yet the 2010 has neither. Spinning off into the fascinating world of winemaking details is not always “crowd pleasing”, so the takeaway here is this wine is worth finding. Due to vintage conditions in 2010, only about half the normal production of this wine was made. Consider putting it on your short list. After recently tasting through other new Owen Roe releases, I sought out this wine since I had not tasted it at the winery. By the first sip, it was apparent that this was a winner. Owen Roe wines are well distributed in many Northwest grocery stores, such as New Seasons and QFC, and many local wine shops. Would You Like Some Doom with Your Pinot Noir? P.Y.T. - Young Winemakers of Oregon on the scene!